A stylish and unique oak topped kitchen island, mobile / standing desk or exhibition stand. This fantastic item has been upcycled using a thick and heavy planked top made from reclaimed oak that sits on industrial style metal base that was originally school gymnasium equipment. This very stylish and beautiful item has bespoke storage trays made for the top metal rungs and there are oak shelves below. The item is a perfect kitchen island, with the shelves ideal for crockery or pans and the storage trays useful for cutlery or other small items. The island would also make a wonderful desk and a gymnasium stool is included, making an unusual and comfortable seat. The height of the item and its ample storage would also make for a very interesting exhibition desk. The oak top is removeable and therefore the desk is easily moved and erected. The oak is reclaimed and has some rustic character marks and wear, giving character and interest. There are some wood knots, splits, marks and cracks but the oak is very solid and strong. There are some small holes and chips. The wood had been waxed and polished and has a rich colour and grain. The metal legs have tarnish, patina, slight surface rust and natural wear, adding an industrial element to the desk. The metal has been lacquered to stop any further tarnish or rust. The stool has some tarnish and surface rust to the metal and some scratches to the suede seat. The desk / island has a wonderful look, fitting both industrial and country, rustic styles. The item is truly unique, making it a fantastic show piece. 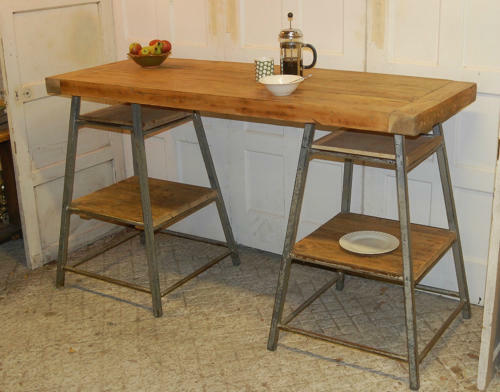 Both useful and stylish, the kitchen island / desk is a must for fans of reclaimed, upcycled pieces. Oak top 182.5cm x 68cm approx.